Little House Home Arts: Register to Win the Great Common-Thread Give Away! Register to Win the Great Common-Thread Give Away! January is my month to be featured as the Artist for the Great Common-Thread Give Away. To win this penny rug pincushion, simply leave a comment at the end of this blog anytime between Monday, Jan 7th and Thursday, Jan 10th. I will choose a winner at random Thursday evening after 10 PM EST. If you have never visited my blog or shop I welcome you! If you have visited me before than likely you know that I started doing felted wool pincushions after making Penny Rugs. Some of my most popular styles of pincushions are what I call, Penny Rug Art. If you don't see what you are looking for or see something that has sold, know that you can contact me to do custom order work. In regards to penny rugs, my research has found that they were originally made from scraps of dark wool fabric or recycled wool felt from used clothes and hats and were used as doormats to clean mud and dirt off shoes. They were named penny rugs as they were made of three different sized medallions layered on top of each other. The top medallion was the size of a penny, and pennies were actually sewn into them to help weight them and make them lie flat. As the top medallion wore out with use, it would be replaced with another, and so these mats lasted for years. They were not colorful or pretty, but merely functional. Penny rugs eventually evolved into a traditional and colorful folk art. Women used their remnants and scraps of wool from making clothes or “turned” wool from used clothes to make their penny rugs. They would use bits of material too small to be used for strips for hooked rugs. Designs evolved from the simple circular medallions into colorful works of art with appliquéd patterns of various animals, stars, hearts and other primitive shapes. People, flowers, homes and scenes told wonderful personal stories and transformed their scraps into wonderful works of art with elaborate stitching. Decorative edging also became part of the art. Scalloped edges or tabs cut in the shape of tongues were added and many of these were decorated with appliquéd circles of wool using colorful blanket stitching. Penny rugs have recently made a “comeback” and are used to cover beds for warmth and decoration or to decorate table and mantel tops, wall hangings and pictures, quilts and pillows or other items, as in my pincushions. For more pictures of my penny rug art work please check out How I Came to do Penny Rug Art, as well as more on The History of Penny Rugs. Don't forget to leave a comment on my blog any time from Monday through Thursday and your name will be entered to win. Good luck and thank you for visiting my blog! How precious these are and have a function! Love the joyfulness of your work! Sue, I see you every where there's a remarkable, talented artist involved. I have one of Jane's large tomato pincushions, which is just a real treasure as I love felted wool. I love your work! So whimsical as well as practical. I know what to put on my birthday wishlist! Hi, I found your site thru Full Moon Fiber Arts. Your work is beautiful; and I enjoyed your words. Old-timey and useful. They look like something my Grama (born in 1898) might have made. Love your work. Hope I win. Your work is simply beautiful -- functional art that would be a joy to own. Please enter my name in your drawing. Thanks! I haven't seen your work before but I love your pincushions! So much more interesting than the standard tomato and strawberry! So nice to discover your work! I've recently begun crafting with wool felt and love it! Many thanks for offering to give away one of your creations! Sorry we were never able to connect with Christmas presents - but I still love your work! Love your pin cushions. Full Moon Fiber Arts sent me. 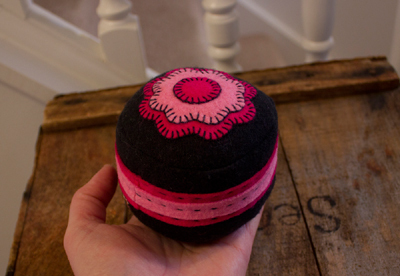 These pin cushions are absolutely charming, have seen your work on Maria's site. I would love to be the winner, plus it matches my bedroom colors! I LOVE all your pincushions...they are sooo sweet! I've got my fingers crossed that I win. Thank you for all the information about Penny Rugs. I had no idea! I would love to be entered in your giveaway. I hope I win. It would look so good in my newly painted sewing room. I love the pin cushions! I'm a quilter and Really think I need one! Beautiful work! I've been reading your blog for awhile and enjoy it and the beautiful crafts that you create! I would so love to win this beautiful work of pincushion art! Thanks for being a part of the give-a-way! Have admired your work since attending the first pig barn sale. I have always regretted not buying one of your pieces, but could not make up my mind. Would love to win one! Much gratitude for you and the circle of artists that support each other. Hello. Yes, I will admit that I am a first-time visitor to your blog. I learned of you and your blog via Maria's website. The Common Thread Give-Away is such a great idea and for all of you to promote the others work. I would love to win this pin cushion! Oh, and thanks for the history on penny rugs! How fabulous is this! Your pincushions are beautiful, I'd love one. Please enter me into the contest, best wishes to all from Canada! Luanne H.
Oh, I love it! A cute little ball of form and function! thank you for the beautiful artwork! I love your pin cushions, and would love to win one. I love the color contrast as well as the functionality! I have another one of your pin cushions and it is full! LOL! I think the next will be for my bead work pins only! Have a blessed week. Really could use your pin cushion as I sew every day..all day! Tis lovely! Count me in! I don't sew, but I would love to give this to my friend! What beautiful pin cushions! I would love to have this one since I don't own a pin cushion. Thank you for sharing your art with the world! I love these pin cushions! And I love the story of the penny rugs that inspired them. I'd never heard of penny rugs and I find it fascinating to learn a new bit of history. This is a great idea! This pincushion is lovely. I learned to sew on my mother's Singer treadle, and a pincushion was always close by. You have brought me a sweet memory. Jane, I am looking forward to giving the pin cushion I bought as a gift, and I can only hope that I am lucky enough to win this beauty for myself! I enjoyed the story of your artistic evolution. I will give this as gift to someone I know who will both use and love it. Please put my name in! Thank you for the chance to own one of your little treasures - roses in winter - how nice! I love this color combination. Beautiful work! ... i love your penny rug art ... and your website ... it's the first time i read about penny rugs! I am a seamstress and do alterations at home. A beautiful pincushion such as yours would be an asset to my sewing table and good advertising for you. Hi, Jane! Thank you for the opportunity to win this lovely pincushion! And your "Spring Flowers" and "Grandma's Bunny" pieces are just beautiful! Just found your site! Beautiful work.I would love to win any of your pincusions especially a black and white one that is square. Thanks so much for the opportunity! Hi. I love the look of the pin cushion. It reminds me of flowers for Valentine's Day. Thank you for offering this as a give-away it is a generous thing to do. So adorable! Would love to win this for my daughter-in-law! This pincushion is way too cute!!! It reminds me of my Mom who was an excellent seamstress and always had a special pincushion. These pincushions are lovely. My Mom and I used felt in a lot of our craft projects. Easy to work with and beautiful when finished! Did Maria send all these people? Your work is beautiful and it looks like all of us would love to have one of your pin cushions~! Looks like you have a really long list of potential winners but please add me to it anyway. One can never be too thin, too rich, or have too many pincushions!!! I love penny rugs. The layered circles are such appealing shapes. Thank you for the chance to win this sweet little pincushion. Love your pincushions. They are so cute and whimsical! I love your pincushions! There is just something about them I cannot describe, they make me smile every time I see them! I would love another one of these beautiful pin cushions. Your work is awesome. Beautiful pincushions. I love feltwork and would love to at sometime work with it. I saw your blog on Maria's blog and glad I did. I would love to win the pin cushion to give it to my sister....they are so nice and make me smile! 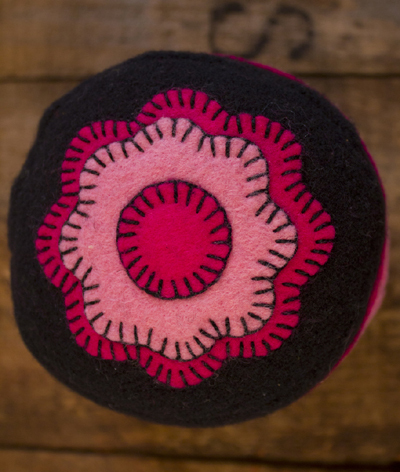 I LOVE your colorful pin cushions and would be super thrilled to win one! I love your pincushion! My sweet dog Sadie just ate my pin cushion last night, so we're both hoping we will win the drawing for a replacement (which Sadie knows would be off limits for her to eat, LOL). Thank you for sharing your lovely art with us! You are so talented. This wonderful pincushion just calls out to belong to my daughter who moved last year from NJ to OH. Both the pincushion and my daughter Sara are practical yet beautiful. I would be delighted if this lovely piece of art could be hers. So creative, functional and beautiful. Would love to own! 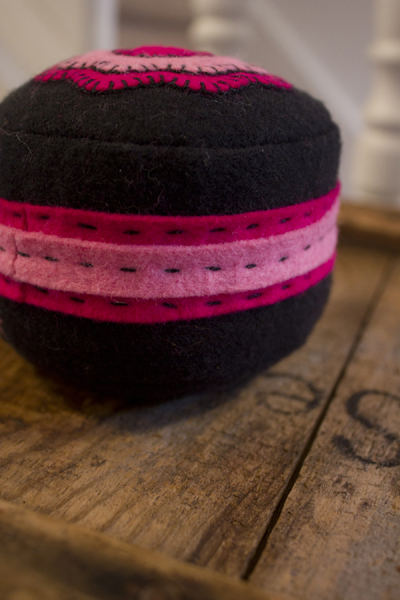 The pincushion resembles the crafts available here in Sweden;felted things with embroidery. First time to your site via Bedlam Farms and then Full Moon Fiber Art. Have a friend that I would love to "gift" this to . . .
beautiful red/pink combo . I would love a large pin cushion for my quilting table. Never considered pincushions as art until I saw yours. Really great work love your pin cushions. Found your site through Maria and will keep coming back! I can't help but think of my grandmother... She would have loved to have a pincushion of yours for a small girl to hold urging her to stand quietly as she marked the hems of my dresses. I follow your blog and I'm amazed at your detailed work. Your work is beautiful. I will also keep coming back!